Friday Fun - Happy Independence Day! We here at WebRevelation wish you and yours a Happy Independence Day! In honor of the 4th of July, following are some great resources for you bloggers who are looking for Independence-Day related content for your blogs. USA.gov has information about the history of the National holiday, laws regarding celebrations in 2010, and safety tips for enjoying the fireworks and outdoor picnics. Holidays.net has information about the history of the 4th of July celebrations in the USA, and about many related monuments, parks, and National celebrations. It also has links to some great 4th of July recipes. History.com's "This Day in History" has a great write-up about the history of Independence Day from 1776 through today. 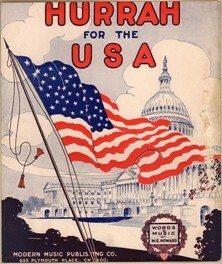 The Library of Congress has a fantastic collection of historical documents and photos relating to the 4th of July celebrations in the U.S. throughout our history, including the photo shown here, which is from the LOC sheet music collection. Finally, my two favorite American historians, David Barton, of Wallbuilders and Bill Federer, of American Minute have some incredible information in their archives about the history of July 4th in America.